3D Printing differs from traditional subtractive manufacturing methods which require starting with a solid piece of material and using cutting tools to progressively remove material. The additive methodology opens up new possibilities in the creation of parts, facilitating rapid, iterative prototyping and development. 3D Printing also provides an inexpensive alternative to conventional injection molding and machining for low rate initial production. We use Airwolf and Up! machines to create your solutions in ABS, PLA (including FLEX), Nylon (Taulman), and Wood. More materials are coming out all the time. Our machines can produce a part with .1 mm resolution! Check out some of the cool things the open source world is readily designing and sharing at Thingiverse, 3DWarehouse, CGTrader, and GrabCAD. 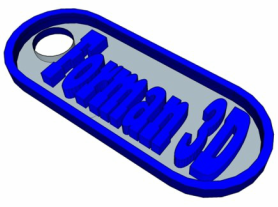 Look through for that little widget you could use... we can 3D Print it for you! Click here to send us your STL or a link to your part and we will quote it for you.